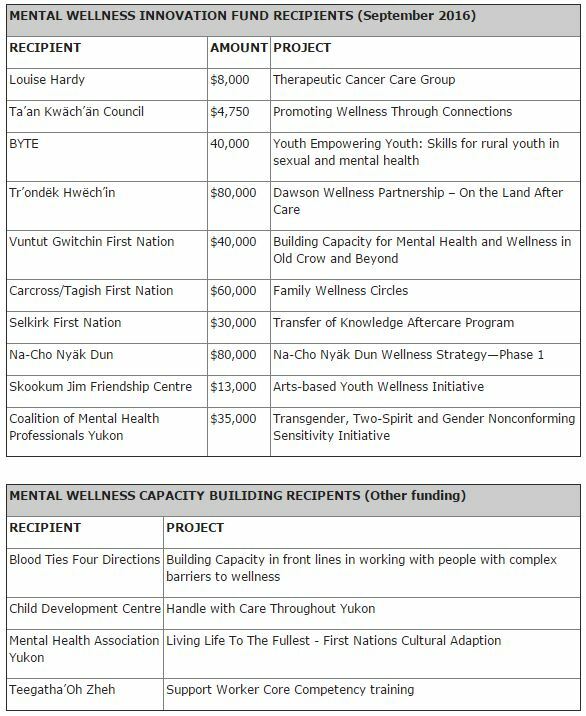 WHITEHORSE—The Government of Yukon and its First Nations partners are awarding a further $390,000 in Mental Wellness Innovation Fund support to 10 community projects. Ten of the 25 applicants to the second intake of the innovation fund will receive funding. Additionally, another four projects focusing on workforce capacity-building will receive funding from the Department of Health and Social Services. All proposals were reviewed by a committee consisting of representatives from the Council of Yukon First Nations, Kwanlin Dün First Nation and the Yukon government. 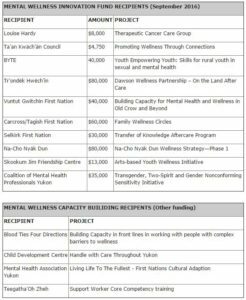 The Mental Wellness Innovation Fund was identified as part of Forward Together: the Yukon Mental Wellness Strategy 2016-2026. The first funding period ended June 30, with 33 applications submitted for consideration. Twelve projects received a total of $620,000 in funding. The fund is intended to: allow organizations to test out new models of delivering services that promote wellness; build capacity in Yukon to deliver effective services; learn from promising and emerging practices that promote wellness; increase coordination and collaboration among care providers; and allow communities to take action on issues of particular priority in their community. Attached is a list of the 10 recipients of the Mental Wellness Innovation Fund. News release #16-319-for electronic version, click here.